Twitter just gained another famous user: President Barack Obama. This seems like a logical next step for an administration that from the start embraced social media — a platform that has come to play a bigger role in how Americans get political news and information. 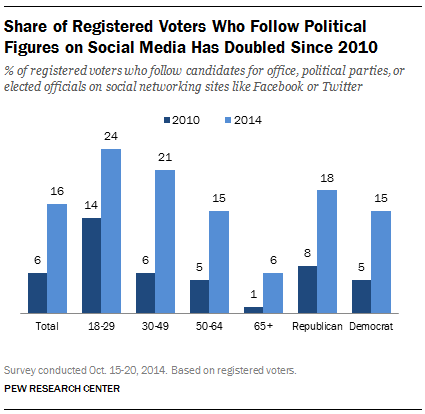 Overall, 16% of registered voters follow candidates for office, political parties, or elected officials on a social networking site, according to a Pew Research Center survey conducted during the lead-up to the 2014 midterm election. That is a 10 percentage point increase from the 2010 midterms, when only 6% of registered voters did so. It’s not just the youngest voters getting in on the act. The increase is even more substantial among registered voters ages 30 to 49, more than tripling from 6% to 21% during this time period. 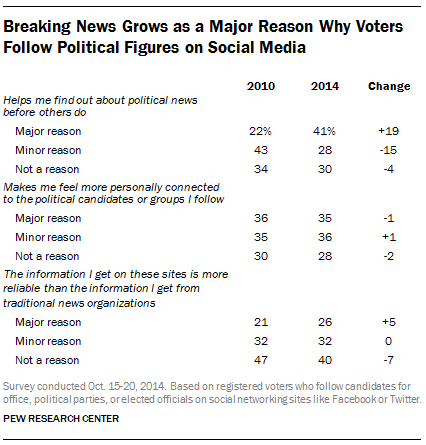 Voters increasingly cite breaking news as a major reason why they follow political figures on social media. Among registered voters who follow political figures on social media, 41% say that finding out political news before others is a “major reason” why they do so. In 2010, just 22% cited this as a key reason. Some voters who connect with political figures on social media say they do so to bypass traditional journalism — 26% say that the information they get via a politician’s social networking site is more reliable than what they get from traditional news organizations. These figures are mostly unchanged since 2010. Another 35% of registered voters who use social media to follow a political candidate say a major reason is that it makes them feel more personally connected to politician or group. While similar shares of Republicans and Democrats follow political figures on social media, there are some partisan differences as to why they choose to do so. Half of Republicans and Republican-leaning independents who follow political figures on social media say breaking news is a major reason for connecting with politicians in this way. This compares with 35% of Democrats and Democrat-leaning independents. Among those who follow political figures on social media, Republicans and independents who lean Republican are also more likely than Democrats and Democrat-leaning independents to say they use social media in this way because news from traditional journalism outlets is not as reliable (33% vs. 20%). The changing way Americans connect with politicians is especially notable given the runup to the 2016 presidential election. Many candidates, including Hillary Clinton, Jeb Bush and Ted Cruz, have used social media platforms to announce or discuss their potential presidential candidacy. And although Obama has only recently joined Twitter, his presidential campaigns have often been praised for effectively using social media to mobilize volunteers and voters.